Why is WiringiPi unable to find hardware revision? Is there something I can do to make it work? Can I modify the cpuinfo file, or there is no solution other than using another linux image? 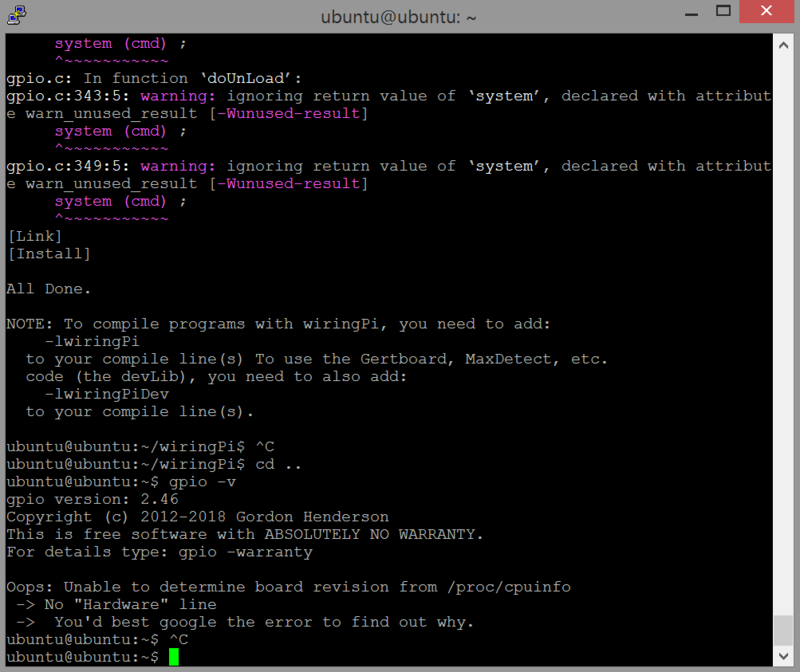 WiringPi is not supported on any other operating systems than Raspbian - so its likely this feature is not supported in Ubuntu. WiringPi is developed directly on a Raspberry Pi running 32-bit Raspbian. I do not support any other platform, cross compiling or operating systems. It has been ported to other platforms, other operating systems and some are cross compiling, however this author does not maintain those systems. If you are trying to use wiringPi on a platform other than the Raspberry Pi with Raspbian then you must contact the person who did the port and not me. Not the answer you're looking for? Browse other questions tagged gpio pi-3b+ ubuntu wiringpi or ask your own question. Why can I no longer find gnome-mahjongg with apt? Is there a way to find a script/program that already uses some of the GPIO pins?